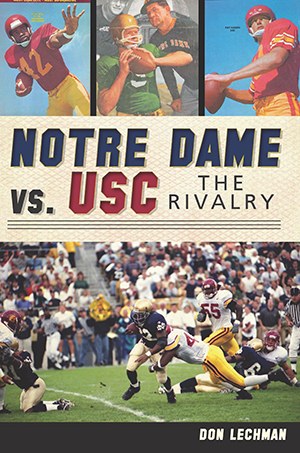 Few sporting rituals court the national interest in the same way as the annual Notre Dame-University of Southern California football game. In more than eighty grudge matches dating from the era of Knute Rockne and Howard Jones, the Trojans ruined potential Irish national titles in 1931, 1938, 1964, 1970, 1971 and 1980. The Fighting Irish obliterated USC national title hopes with season-ending victories in 1947 and 1952 and handed the Trojans their first losses of 1927, 1973 and 1995. The Irish bounced USC from No. 1 in 1968 with a legendary 21-21 tie and ensured their own 1988 national championship with a 27-19 victory. Join author Don Lechman as he recounts the exploits of Johnny Lujack, Anthony Davis and hundreds of others in the gloried battles of Notre Dame vs. USC. Don Lechman worked in newspaper journalism for more than forty years.